Razglednica gostilne Ivana Gombača - Naneta iz konca 19. stol. The house was entered into the cadastral map in 1819, but it is believed to be older. Three house names are known: Pr Lesandrovh, Pr Nanetovh and Pr Ankici. The first known owner was, from the 1840s, Franc Josip Mahorčič (1817–1883), son of the mayor of Naklo Josip Mahorčič, after whom the Mahorčič Cave was named in 1819. In this house, the first publicans were his son Aleksander (1849–1907) and his wife Marija Dobrovoljny. After her husband's death she sold the homestead to her relative Julijana Mahorčič, married name Gombač – »Janezvi«, from Matavun, who bought it for one of her sons Ivan Gombač (1847–1907). From 1912 on, Ivan, together with his wife Marija (»Marica«; 1884–1972), the daughter of mayor Ivan Dujc from Loka at Zavrhek, and their daughter Ana Marija (»Ankica«; 1913–2001) continued the catering business and began renting rooms to holidaymakers, especially to those from Trieste. During that period, various local families occasionally spent time here as well, as there was plenty of space. Before 1926, the building behind the house was for some time the seat of the Naklo municipality, which was then one of the biggest municipalities in the Karst. For a short period of time between the World Wars the building served as a sanatorium for lung patients. 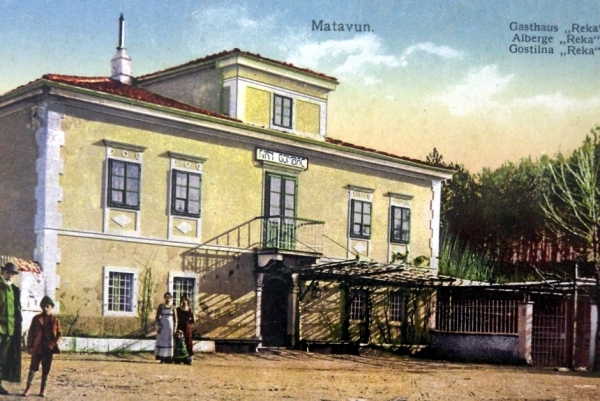 After World War II the pub was first rented by the Risnik catering company from Divača (HTG Sežana) and later by Franc Gombač from Naklo. During that period the courtyard was the venue of travelling cinema shows, dances and folk plays, while local men passionately played bocce and cards there. During the school year the pub hosted teachers who taught at the primary school in Škocjan, active from 1845 to 1962. In 1967 the pub was closed due to bad conditions by order of the inspection. Despite the closure of the pub, Ms. Ankica lived in the house until her death in 2001. In 2006 the building was purchased by Park Škocjanske jame, Slovenija.